It's Friday!!! And we are more than halfway through this crazy, busy month of May!! We may be crawling across the finish line, but we will make it! As always, I am linking up with some of my favorite blogging friends, Andrea, Narci, and Erika to share a few of my Friday Favorites. A whole lot of randomness making the list today... from puppies to flowers to edible cookie dough! My sweet Mother's Day gifts! I just love all the handmade cards and gifts. 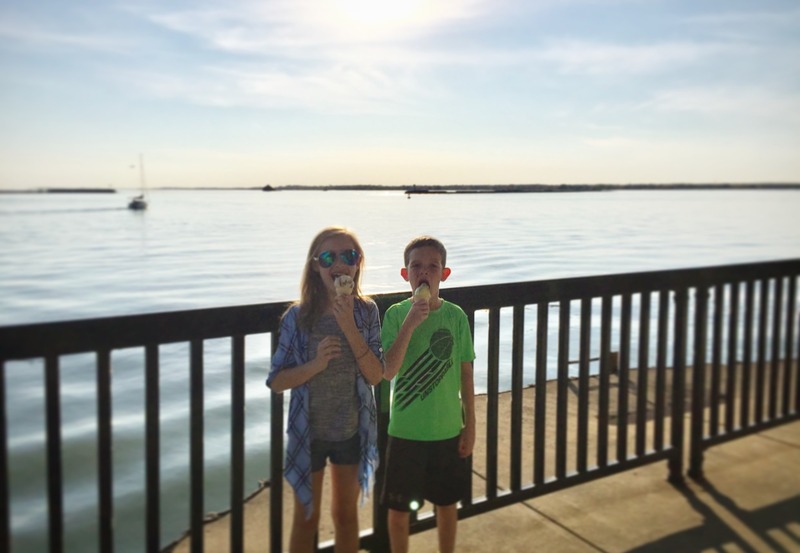 I recapped all our Mother's Day weekend fun the other day... you can catch up here. The 80 degree weather this week!!! Yay!! After such a rainy start to May this week's warmth and sunshine felt so good! Tuesday night we finally got the boat in the water. A sure sign that summer is almost here! 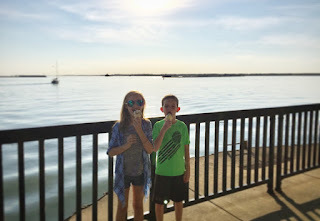 And our new marina has an ice cream shop right there, so of course we stopped there too! Another sure sign of summer! I linked up on Tuesday for Tuesday Talk and shared our story on life with a dog. I had never been a "dog person", but gosh how that has changed! You can catch up on life with a sweet (and sometimes messy) puppy here. Wednesday morning my Luke took one look at me and said "Mama, those are cool pants". Ha! They were a bright blue color and he loves all things blue, so I was pretty cool to him that day. Then we laughed when we saw were kind of dressed in the same colors! Ella had her class Fun Day this week. Every year her school hosts a fun day/field day for each grade near the end of the year. It's a favorite day of hers, for sure and mine too, since parents are invited to stop by! And now Luke is anxiously awaiting his day.....coming up in two weeks. I grabbed a few plants for my pots this week and I cannot wait to get started planting. I don't have the greenest thumb... somehow I missed that quality from my mom. But I give it my best. I just love the bright pinks! We have a new-ish local bakery and they just started serving edible cookie dough. Yep... edible cookie dough. It is amazing! You can get in a cone or dish and sample up to 3 flavors. So of course we had to try it out! We sampled Chocolate Chip, Sea Salt Caramel & Peanut Butter Fudge. Super sweet and super good! Local friends, be sure to put a stop to Kaylena Marie's Bakery on your to do list this weekend! Whew.. that 's my random list of favorites for the week! We have got a pretty full weekend... dance competition, baseball games, soccer game, baseball pics, and I am off to see Wicked with my Mom & sister.. yay! See you next week... there's always room for one more at our family table.